Home / Viral / Vivian Velez slams Noynoy & De Lima - Investigate the whole "yellow army"
Vivian Velez slams Noynoy & De Lima - Investigate the whole "yellow army"
In her Facebook post, Veteran actress Vivian Velez asked both former President Noynoy Aquino and Senator Leila De Lima why illegal drugs in the country multiplied during their tenure. She even said in her statement that yellow army or Aquino administration must investigate. 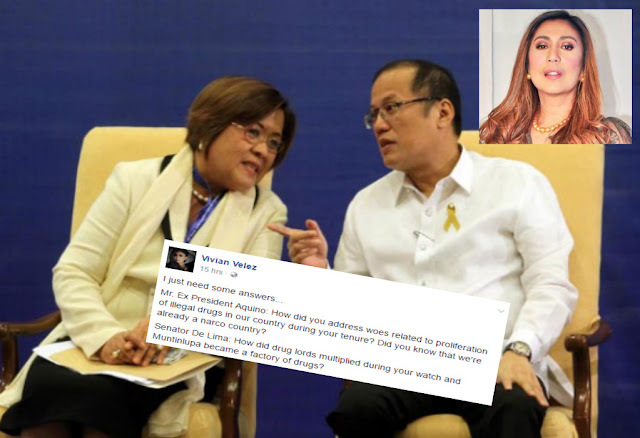 Miss Velez wonder why former President Noynoy not even mention the drug problem in his all SONA. 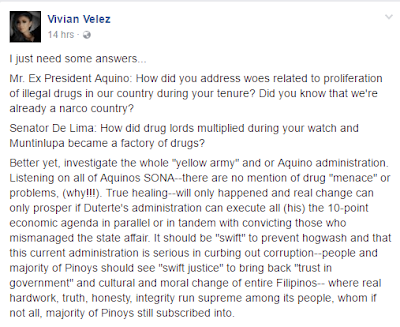 Mr. Ex President Aquino: How did you address woes related to proliferation of illegal drugs in our country during your tenure? Did you know that we're already a narco country? 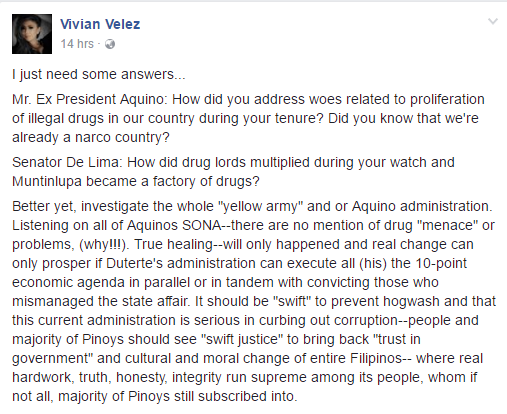 Senator De Lima: How did drug lords multiplied during your watch and Muntinlupa became a factory of drugs? Better yet, investigate the whole "yellow army" and or Aquino administration. Listening on all of Aquinos SONA--there are no mention of drug "menace" or problems, (why!!!). True healing--will only happened and real change can only prosper if Duterte's administration can execute all (his) the 10-point economic agenda in parallel or in tandem with convicting those who mismanaged the state affair. It should be "swift" to prevent hogwash and that this current administration is serious in curbing out corruption--people and majority of Pinoys should see "swift justice" to bring back "trust in government" and cultural and moral change of entire Filipinos-- where real hardwork, truth, honesty, integrity run supreme among its people, whom if not all, majority of Pinoys still subscribed into.